COOLHAUS! Just in time for summer, if you are in the LA Area this great wagon o goodness is here for you! These architecturally inspired ice cream sandwiches only employ the best (organic whenever they can) products for their handmade artisanal ice cream flavors like mexican chocolate, marscapone balsamic fig and brown butter with candied bacon. These bovine derived beauties are folded between two homemade cookies that are bound to make your mouth smile. They are a moving operation so make sure you check in with their website or twitter feed for up to date coordinates on this well loved wonder! Also the ladies that run this operation are pretty sweet themselves. 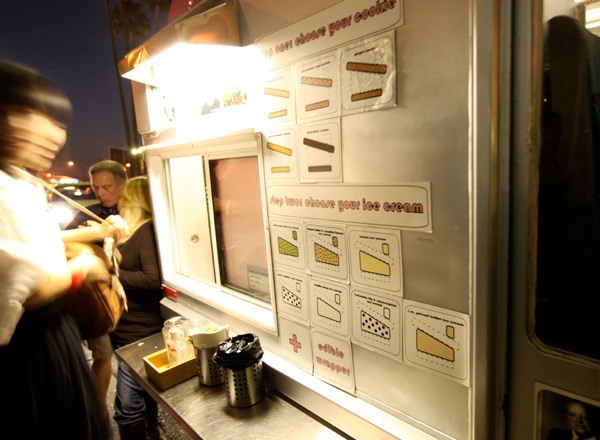 Check out GOOD Magazine's Inventions video and see how the Coolhaus ladies would reframe our world! Shout out to my friend Mike Ashton and his sweet special effects on the video.